Prison is a violent and inhumane response to the social problems faced by vulnerable women and non-binary people. In the UK, at least 46% of women in prison are survivors of domestic violence, while 81% are imprisoned for non-violent offences, often related to survival and exploitation. 53% of women in prison report having experienced emotional, physical or sexual abuse during childhood. If trans women and gender non-conforming people were included (we are not counted at all in prison statistics), these figures would be even higher. Despite this, domestic and sexual violence services have had their government funding brutally removed under Tory austerity, with 66% of domestic violence services on the edge of collapse due to cuts. Within prisons, vital mental health, counselling and addiction services have been withdrawn, leaving prisoners even further isolated and at risk of harm. Prisoners like Sarah Reed, who died in HMP Holloway in January 2016, after a string of institutional abuse and failure to provide adequate mental health support. If vulnerable women and non-binary people were able to access the housing, welfare and therapeutic services we need, we wouldn’t end up in prison simply by committing ‘crimes’ that enable our survival. What’s happened to HMP Holloway? Late last year, the largest women’s prison in Europe, HMP Holloway, closed suddenly. Since the 600 inmates were moved to private mega-prison HMP Bronzefield and HMP Downsview in Surrey, the 8-acre plot of public land in Holloway has been left vacant. Despite the closure of Holloway, and the horrifying upward trend in suicide, self-harm and abuse in our prisons, the government have no intention of reducing the UK’s prison population. Plans to build nine new super prisons were announced in March 2017. The Ministry of Justice has brought in private estate agents Bilfinger GVA to help sell the Holloway site. They are most well known for installing ‘homeless spikes’ outside their buildings in Manchester and for their rampant gentrification projects. Holloway is public land – we own it! Sisters Uncut, and other local campaign groups, fear Bilfinger GVA’s involvement means luxury flats and nothing for the community. 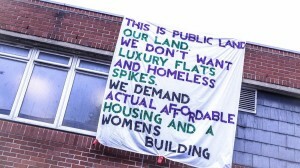 In May this year, North London Sisters Uncut reclaimed the former Visitors’ Centre at Holloway to demand that the land be used to provide support to survivors of domestic, sexual and state violence. We demand that the site hosts a women’s* building, where life-saving domestic violence and therapeutic services are offered, especially supporting survivors of colour, LGBTQ and disabled survivors. Funding services using money from the sale of the site would be a symbol of recognition and reparation for local survivors of domestic and sexual violence and the women of Holloway Prison. We also demand the majority of the site be used for social housing. 60% of female prisoners are homeless on release and the same number say a home would have stopped them reoffending. There are 20,000 households on the waiting list for social housing in Islington. This is a crisis – which should be addressed before the idea of luxury flats is ever entertained. Islington needs genuinely affordable and accessible housing for domestic violence survivors and local families. Our reclamation of the site, plus the amazing campaign from the Reclaim Holloway Coalition, drew significant attention to the Ministry of Justice’s plans for Holloway. As a result, Islington Council have included our demand for a women’s* building in their draft plan and also say they want to include “affordable housing” in the new development. Although our demands have, to some extent, been included in the draft plan, there is a high risk of them being conveniently lost. The Ministry of Justice has clearly said they are prioritising getting the highest value for the land – which comes from luxury private development and rarely from community development programmes. So we have to make it clear that this is our land and we want it to be used for our good! The council have opened a short public survey, asking for our views on the draft plans for the site. You can fill out this survey whether or not you are a resident in Islington, so please help us add more voices to our call for the publicly owned site to be used for public good. The survey takes no more than 10 minutes to fill out, and must be done before midnight on October 2. Most of the survey consists of simple agree/disagree tick boxes. But unfortunately, getting Islington Council to prioritise what the community needs requires a bit of working around the council’s strategy. Question 3 gives an opportunity for the public to support the building of ‘Housing (including affordable housing).’ However, “affordable housing” is defined as 80% of Local market rent and Islington is one of the most expensive boroughs in London. The average price of renting a 2-bed flat in the borough is £1950 a month, nowhere near affordable for the people most in need. Few, if any, of the 20,000 households on the waiting list for social housing in Islington will be able to access this type of “affordable housing”. We need to make it clear that we want and need social housing as a matter of community urgency. Question 4 asks respondents to express their interest in ‘non-residential uses’ – which includes both the women’s* building and ‘a small amount of retail/commercial space.’ These two uses are entirely different – and the area is not lacking in retail space – so it’s important we stress that a women’s* building is a community priority over retail space. Please share the survey and this post with your friends, family and neighbours – encourage them to support a community-led redevelopment of the former prison site. It’s vital that the views and needs of women and non-binary people in our community are prioritised. *; ‘Women’s Building’ is the language used by Islington Council. We will fight for a building and services that are available to all non-binary, gender non-conforming people and women and that the name is changed to reflect that.